My new blog on The Parenting Adventures, which has also being published on my blog website: www.carrieshomemadelife.com. You have all the food prepared, which has been blitzed, your son like mine may freak out a bit because of the noise of the blender which you say to him “Don’t worry just getting your dinner ready” him looking at you trying to suss out what it is you are actually saying. It is pureed or to the point where some bits are chunky as now you want to encourage him to start chewing, using his new set of teeth that have come through; you have him sitting in his high chair or baby chair that can be moved up so you baby can sit up right, you put his bib on and you get the muslin and kitchen towel ready, for any spillages and dribbles. Your son knows now that when he see this colourful little bowl that it is meal time, you spoon the food to feed him and takes a taste and screws his face as if to say “What on earth is this?”. You think oh no “Is it good or bad?” and you serve him another bit of the food and he turns his head away, swishing his hand to push the spoon away which now it is all over your son and yourself, and you think “lets add more milk or warm water and still he turns away, screams as if to say “No this is disgusting stop serving this muck”, and you feel that all your efforts to preparing this lovely dish for your child was a complete waste of time. Your child has no idea how long it has taken to prepare this food, the courage it took especially if not cooked or made a fresh meal before but you wanted to for your little one. It can be so frustrating and you can feel like it is a personal attack on you. At the moment you may not believe me when I say “It isn’t anything personal” you see what I think is misunderstood and I have realised this watching my little bubs develop from when I first saw him in his incubator was that they make decisions from the moment they are born. E.g. when our son was tiny and a day old, he didn’t like being stroked he would wriggle and make a little wincing sound as if to say “whoever that is get off I am trying to sleep”. When they don’t like certain foods it is their way of learning what they like and don’t like by tasting different foods and flavours. It can be off putting when they refuse to eat some food you have prepared, but it is part of their development. When they do like a meal you have made, then it will 1. Be a relief 2. See if they have sweet tooth or like sour foods, or both 3. If they have any foods that disagrees with them (allergy, gives them a bade tummy or makes them sick). It can be hard work but it can also be a great time and fun. I would say try sweet potatoes, white potatoes, carrots, bananas, sweetcorn, peas, and added to baby rice for example, mixed in with their milk can really help just blitz down at first so there are no bits, as at first they need to get used to the tastes and the foods, and then when they get to 9 months or so you can make it a little chunkier to encourage them to chew. At the moment our son is not really getting finger foods, as he will put in his mouth, bang it on his walk or high chair then throw it on the floor. If you have not got used to mess, then you will do by the time your son has gotten used to normal foods. I say make sure you have your Dettol wipes and baby wipes at hand for any mess made, you just have to accept that babies are mucky, they see it as something they can eat, throw and spread all over any surface they come into contact with. 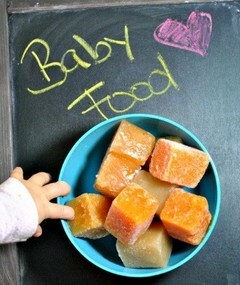 For good ideas on help with baby food their are some great tips on The Baby Centre and Net Mums. I found the HiPP, Heinz, Elle’s Kitchen and Boots Organic food pouches were brilliant and still using them up to 10 months plus, to the food pots for 1-3 years. However it whatever works for your baby, some may take to the jars better or from home fresh foods. I do a mixture of using the pouches and making some meals for our son with our own food, to get him used to eating what we eat. For the record Boots, Wilkinsons, Morrisons, Sainsburies and Asda, all do some great deals on baby food from all the stages of weaning. I hope this useful to all those mums out there, and lets get our babies fed. My son is now 14 months and I think to myself where has the time gone. I still get amazed with how much he had grown, to those who have subscribed on my wordpress site, many thanks. It has been an amazing experience, challenging but I would not change it for the world. We have had tears and tantrums when trying to wean him onto our food aswell as baby food. Thank the lord for Elle’s Kitchen, Aptamil, Heinz and Boots do a good range of their own baby food too, and do a great price on nappies. However seeing him eat a Petit Filous yogurt, a bit of chocolate (I know not the best thing to give please don’t judge me just wanted to see if he liked it or not) and little pieces of bread, which he has liked has been indescribable same with seeing him smile, talk, hold his head up, crawl, sit up and now standing for the first time. Being a mum has changed my life and also my views on things. I think as you get older your look on things changes and opinions as you do see things differently when you reach certain stages of your life. Example how I saw things when I was 20 is now different to how I see things now as I am now in my 30’s. Being a mum changes the way you see things too, like working and on things such as bullying how I see myself, because I know that if I am not careful my son will pick up on my insecurities. Also I have to watch what I say, trying not to swear is hard. I know I need to do it we tried the swearing box but didn’t last as I would have had no money at all. However with practice and persistence my cursing has got a lot better. I do have to do things out of my comfort zone, like at the moment I am looking for a Childminder and it is hard trying to find a good total stranger to look after my child. Obviously I will meet them first but as a mum I can’t help but worry and the prospect of having to call around and meet up with the person I do get very apprehensive as I find certain social situations difficult. However I know it will get sorted and I am enjoying present at the moment with my son but also looking forward to the future too.